Revitalize your skin to its true radiance and address your pain and discomfort with Celluma light therapy! Light therapy, proven by science, to promote and improve cellular health — from curtailing the signs of aging and acne to finding refuge in its pain relief healing. Celluma is an innovative way to implement light therapy into your health and wellness journey. Backed and cleared by the FDA for the treatment of pain and skin concerns, Celluma incorporates light for healing by speeding tissue repair and revitalizing cells. And while there are many other options on the market, choosing Celluma provides you with an all-in-one system that is versatile as it is convenient and can be easily used in conjunction with your acupuncture appointment. LEDs are the light source that powers healing in Celluma, and just as a plant is nourished from the sun, LEDs penetrate our skin and trigger our body’s natural healing process. Whether you’re trying to manage chronic or acute pain, Celluma is the ideal natural and drug-free solution. Because LEDs are able to penetrate our skin layers on a deep level, the wavelengths are absorbed by the photoreceptors in the mitochondria. As they are triggered, ATP synthesis occurs as a result which fuels cellular energy and rapidly supports tissue repair and reduces pain and inflammation. Celluma addresses skin health for those who are looking for its anti-aging benefits and acne treatment. Anti-aging – If your skin is looking less than refreshed and bright, Celluma is a great option. Tighten saggy skin and improve your fine lines and wrinkles, in addition to combating and smoothing your skin’s texture and overall quality. The wavelengths stimulate collagen and elastin production, which gives you a non-toxic and non-invasive approach to skincare. Acne – Acne is a skin condition that is notoriously hard to treat. 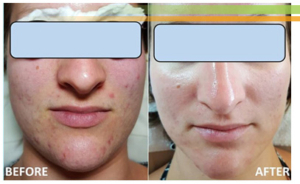 Celluma is a gentle and non-abrasive alternative to healing your acne. If you’re tired of chemicals and the side effects they bring, step into the light! The LED light destroys acne-causing bacteria to clear up your current blemishes and prevent future breakouts. 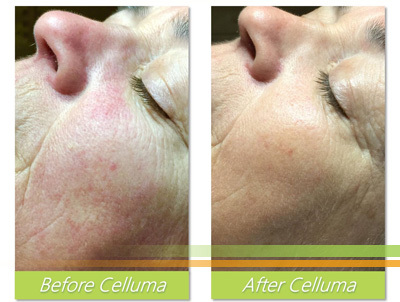 Get clearer, smoother, and more radiant skin with Celluma. Want to learn more about Celluma? Connect with our office and ask how we can implement Celluma into your next treatment! 540 East McNab Road, Suite D.